CSA Executive Director, Stephanie Ursini-Bennett, has dedicated her services full time to the members of CSA. She is available for special projects and peak period coverage in your office or remote access. View her expertise here. 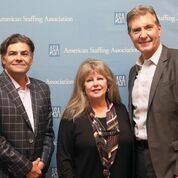 Stephanie is shown at the right with Kelly McCreight, immediate past chairman, ASA board of directors and president and chief executive officer of Hamilton-Ryker and ASA president and CEO, Richard Wahlquist at ASAs Staffing World October, 2018. CSA once again receiving an award for the fastest growing staffing association in the U.S.
As a member you are offered affordable creative writing services for brochures, website, e-news, social media, posters and more. We can also offer you professional help with job postings, recruiting and screening for vacation, peak periods, and employee vacancy. Need help to plan events for the holidays and or job fairs -- we are specialists. Just call Stephanie at 720-220-5122 or Stephanie@ColoradoStaffing.org for an appointment and/or to get a quote. If you need full time assistance with any staffing services just click on the Industry Partners page and you will find a plethora of services along with their contact information. Or contact Stephanie at the above information.